Heat oven to 350°. Line two baking sheets with parchment paper, and set aside. Separate 1 egg. Set aside the white. In a small bowl, whisk together yolk, remaining egg, and vanilla. Set aside. In the bowl of an electric mixer fitted with the paddle attachment, combine butter, confectioners' sugar, granulated sugar, and salt. Beat on medium speed until well combined. Add egg mixture, and beat until smooth, about 2 minutes. Add the flour, and mix on low speed just until incorporated. Wrap the dough in plastic, and chill until firm, 20 to 30 minutes. Divide the dough in half. Work with one piece at a time, keeping remaining dough covered with plastic wrap and chilled. Divide the first half into fifteen pieces. On a lightly floured surface, roll each piece back and forth with palms into finger shapes, 3 to 4 inches long. Pinch dough in two places to form knuckles. Score each knuckle lightly with the back of a small knife. Transfer fingers to prepared baking sheets. Repeat with remaining dough. When all fingers are formed, brush lightly with egg white. 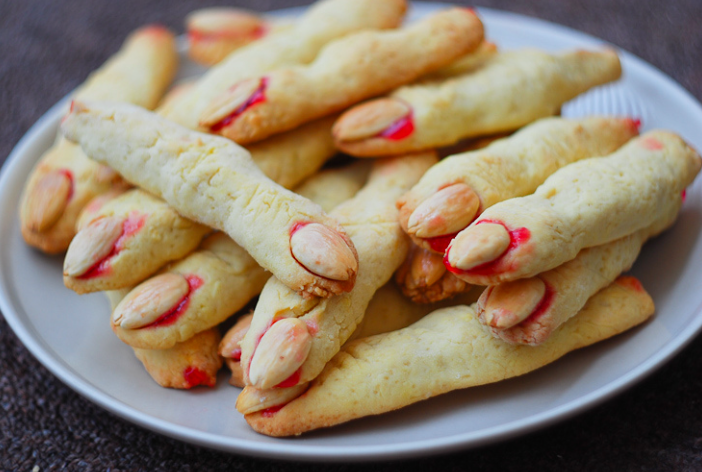 Position almond nails by dabbing a small amount of raspberry jam into tip and pushing into dough to attach. Dab a little amount of jam on the other "severed" end of the fingers as well. Bake until lightly browned, about 12 minutes. Cool completely. note: To make the knuckles more creepy just shape them big and uneven. To keep them from puffing out too much roll the fingers extra skinny (skinnier than you want them to look if that makes sense). I also try to get them out of the oven before they brown. I sometimes add a bit of almond extract to dough. I made a version of these last year and they were a hit! I tinted the dough with a little green food coloring and used slivered almonds for the "nails". Some were broken a bit so they looked even more creepy! I love the addition of the jelly to make the "blood"!!! I made some of these for the first time last year. They were delish and creepy. For more of the Ick Factor, I lightly brushed cocoa powder on the knuckles and around the finger nails to make them look dirty. Will have to try it with the raspberry jam this year!